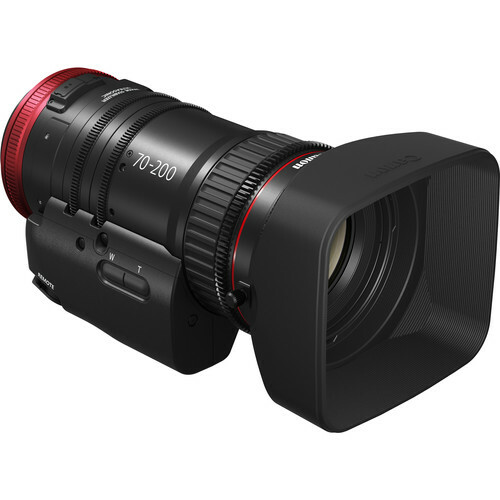 The Canon CN-E 70-200mm Compact servo zoom combines the quality of a cinema lens with a lightweight servo zoom, taking the best of both worlds, and creating a sharp, but versatile cinema lens ideal for documentary or run and gun shoots! The 70-200 is color matched to all other Canon CN-E lenses, making it a great addition to any CN-E kit. Plus the lens is built with canon's USM Autofocus technology, so you get quiet, fast, and reliable autofocus! The servo motors are powered through the electronic EF mount meaning you wont need to run bulky gold mount bricks! With built in image stabilization, a light weight form, and a parfocal design, this lens was built for hand held and shoulder work. Wether you are shooting a documentary, live event, or just need a versatile telephoto zoom lens suited for any long range situation, the CN-E 70-200mm Compact servo is the perfect fit! 3.7 x 4.2 x 7.2"